After being missing from the Marvel Cinematic Universe movies since his "death" in The Avengers in 2012, Agent Phil Coulson is finally making his triumphant return to the big screen with next year's Captain Marvel. Fortunately, we don't have to wait until March to see him back in action. On Tuesday morning, Marvel Studios unleashed the first official trailer for Captain Marvel during a new episode of Good Morning America, and it was filled with quite a few awesome shots of Brie Larson's Carol Danvers kicking it into high gear. Additionally, the 1990s-set trailer also gave us some glimpses at a younger Nick Fury, played by Samuel L. Jackson, as well as the very first look at young Phil Coulson. During one brief shot in the second half of the trailer, you'll see Coulson, played by Clark Gregg, taking off his aviator sunglasses in the most Top Gun way imaginable. You can check out a photo of Young Coulson's debut below! Not only does Coulson appear with a set of awesome shades, but he's also a brand new haircut to show off his younger age. 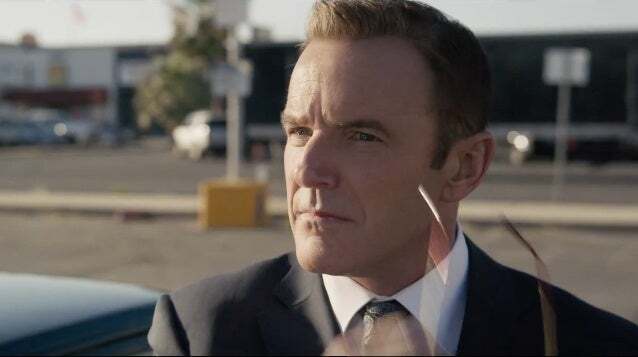 Instead of the professional agent-style hair that he's become known for, Coulson is seen in this trailer sporting a young, hip haircut, complete with a bit of '90s spike in the front. Since Captain Marvel takes place in the 1990s, several characters from past MCU films are able to make an appearance. Coulson and Fury are both going to return and work for SHIELD, just as they did in the other films. Additionally, Ronan and Korath, Kree warriors who acted as villains in 2014's Guardians of the Galaxy, will both be appearing alongside Carol Danvers in this film. What do you think of this new, younger look for Phil Coulson? Is his first name really Phil, or is it actually Agent, as Tony Stark suggests? Let us know in the comments below! Captain Marvel, starring Brie Larson, is set to fly into theaters on March 8, 2019. The character will also appear in the still-untitled Avengers 4, which arrives on May 3, 2019.